1. Stephen PHILLIPS was born 1793 in Robeson County, North Carolina to Jesse PHILLIPS and Mary Ann GLARE (daughter of Stephen GLARE and Mary ?). He married Martha Unknown, born 1793 in North Carolina. After their children were born they moved to Sumter Co., Georgia. They are found in the 1850 Census there. NOTES for Stephen Phillips: Stephen was railroaded out of N.C. The reason was that he was caught trading with a black man after dark. Blacks, at this time, were not allowed to trade after dark. There were other men who wanted Stephen's property and had a black man go to Stephen after dark to trade a pig for some cotton seed. These same men hid in the bushes and watched as the trade took place. They went to Stephen and told him what they witnessed and blackmailed Stephen out of the state. He came to settle in Sumter County, Georgia, where he and his wife died. NOTES for Stephen and Mary Glare: This couple was poisoned in 1793 by one of their house wenches, named Hanna. She was later caught and hanged in a tree in front of the Glare home in Robeson County, N.C. In 1775 of Bladen County, N.C. Stephen Glare was witness for John Phillips buying 200 acres for 24 lbs. from John Smith on Flowers Swamp. It is believed that this John Phillips is the father of Jesse Phillips who married Mary Ann Glare. No proof at this time. According to the grandfather's will, Stephen Phillips full name was Stephen Glare PHILLIPS. Stephen had at least one brother Jesse Jr. who married Elizabeth STORM, and one sister Polla (Mary) who married William ELKINS and moved to Illinois. Jesse Jr. stayed in N.C. NOTE: Mary Ann GLARE had five sisters: Elizabeth m. Sion PITTMAN, Esther m. James SMITH, Celia m. William BRITT, Sarah m. a LITTLE, and Boneter m. a SMITH. ii. Anna b. 1825, N.C.
iv. Martha Ann b. 1829 N.C.
m. Nov. 24, 1850, Sumter Co., Ga.
v. Eliza J. b. 1834 N.C.
2. John Wilson PHILLIPS was born 1826 in North Carolina. He married 18 Sept 1851 in Sumter Co., Ga, to Edith Ann "Edie/Edyann" BARLOW b. 1834 in Alabama (NOTE: It is believed that she was the daughter of John or James BARLOW and Elizabeth Unknown) d.Miller Co., Ga. John Phillips died in Miller Co., Ga. Both are buried at Bellevue Cemetary in Miller Co., Ga.
NOTES for John Phillips: After John and Edith married, John moved a house onto Stephen's (his father) property. The two had a horrific verbal fight about it because John had put the house in a place Stephen didn't want him to. John and Edith left for Barbour County Alabama where her family lived. This is where their first five children were born. 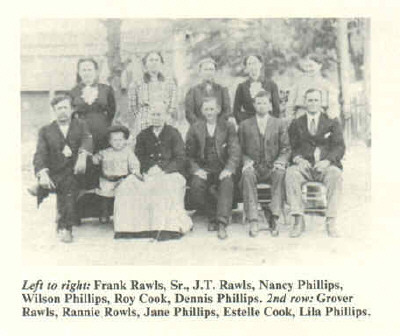 They then moved back to Georgia and settled in the Bellview area for Miller County and raised their family. They are buried at the Bellview Baptist Chruch in Miller County, Ga. John and his father never spoke to each other after the fight. NOTE: Edith had these siblings: William b. 1833 Ga. m. Susan?? ; Wilson Hugh b. 1835 (twin to Edith) and m. Mary Ann Brown Jan 2,1862 in Sumter Co., Ga.; Henry b. 1837 Ga.; Elizabeth b. 1840 Ga.; and Sarah b. 1841 Ga. Any additional information on Edith would be most appreciated. Thank you. xiii. Charlie Bruce b. 3 Mar 1876; Georgia. 3. Marianne F. PHILLIPS was born 1857 and married Amos Sam ADDISON. 4. John Wilson PHILLIPS Jr. was born 25 Aug 1860 in Ga. He married Nancy Jane PHILLIPS, b. 13 Sept 1866,(daughter of John A. "Grandser" PHILLIPS and Nancy Lucille POWELL)d. 25 Feb 1945 in Miller Co., Ga. John died 13 Nov 1922. Both are buried at Pilgram's Rest (White's Bridge) Baptist Church. This is a picture I found of John Wilson and Nancy Jane Phillips. NOTE: I am trying to find more information on Nancy POWELL. 5. Andrew Stephen PHILLIPS was born 6 May 1866 and died 4 July 1924 in Miller Co., Ga. He married abt 1885 to Mary Alice DEES b. 7 Apr 1867 and died 24 Sept 1931 in Miller Co., Ga.
6.Ludie Eustus PHILLIPS b. 26 Sept. 1887 d. 10 July 1961, married 17 Jan 1909, Minnie Beatrice KIMBREL b. 25 Jan 1885 d. 18 Oct 1974. Both died in Miller Co., Ga. Buried at Pilgram's Rest Church. 7. John Perry PHILLIPS b. 1890, d. 20 Nov 1972, married Elizabeth "Bessie" OLIVER. John died in Miller Co., Ga. Bessie died in Miami, Fl. ii. Billy B. Phillips Jr.
9. Smiley Wilkin PHILLIPS b. 10 Nov 1893, d. 22 Jun 1937, married 28 Jan 1922 Florence YATES b. 11 Jan 1894 d. 15 Jun 1935. Both died in Miller Co., Ga. and are buried at Pilgram's Rest Chruch. 10. Idus Oliver PHILLIPS b. 31 Jan 1896 d. 21 May 1964, married 7 Feb 1917 to Emma Mae SCOTT b. 7 Feb 1899, d. 17 Apr 1986. Both died in Decatur Co., Ga. and are buried at Bellview Baptist Church in Miller Co. Ga.
11. Dewey Wilson PHILLIPS b. 13 Jul 1898 d. 25 Nov 1971, married 13 Nov 1922 Ella ALSTON b. 13 Apr 1902 d. 21 Feb 1967. Both died in Miller Co., Ga. and are buried at Pilgram's Rest Church. 12. Cappie Clara PHILLIPS married Bracy Oran PHILLIPS. Both died in Miller Co. Ga. and buried at Pilgram's Rest Church. 13. Maston O'Neal Sr. PHILLIPS was born 14 Nov 1902 in Miller Co. Ga. He married (1)Rachel MILLER-no children; (2) married on 3 July 1926 to Leona Ruth DONALSON b. 29 Aug 1907 in Decatur Co., Ga.(daughter of John William DONALSON and Dolly Mae DODSON). "O'Neal" died 24 Feb 1981 in Miller Co., Ga. "Ruth" died 29 Oct 1988 in Miller Co. Ga. Both are buried at Pilgram's Rest Church in Miller Co., Ga.
b. 1927, Miller Co., Ga.
died 1933, Miller Co., Ga.
b. 1942, Miller Co., Ga.
d. 1944, Miller Co., Ga.
d. 1946, Miller Co., Ga.
d. 1949, Miller Co., Ga.
14. Lucille PHILLIPS married (1)Bill MAINE; (2)Harold CUFFE- no children; (3)Euly GREEN-no children. 15. Janie Inez PHILLIPS married (1)Bronnie O. BRONSON; married (2)Carl WOLFF. 16. Susie Marguerite PHILLIPS married Fred JONES. 17. Ludie Curtis PHILLIPS b. 1917 d. 1995 married 1937 Lois MIDDLETON b. 1922 d. 1978. 18. Wendell PHILLIPS married Lureen Unknown PHILLIPS. 19. John Paul PHILLIPS married Elizabeth Unknown PHILLIPS. i. John Paul Phillips Jr.
20. John Wilson Sr. PHILLIPS was born in Miller Co., Ga. and married (1)Mary Ellen COOK from Decatur Co., Ga; married (2)Loretta GORDON from Miller Co., Ga.-no children. +30 i. John Wilson Phillips Jr.
21. Dollie Estelle PHILLIPS was born in Miller Co., Ga and married (1)Martin ADKINS from Columbus Ga. married (2)Glenn CHILDREE born in Alabama-no children. 22. Katie Azziline PHILLIPS was born in Miller Co., Ga. and married Malvin Percy NIX born in Decatur Co., Ga.
23. Maston O'Neal Jr. PHILLIPS was born in Miller Co., Ga. and married Patricia "Pat" WILLIS from Pelham, Ga.
24. Nancy Lois PHILLIPS was born in Miller Co., Ga. and married Alley R. WILBOURN from Early Co., Ga.
25. Harry Anderson PHILLIPS was born 5 Apr 1938 in Miller Co., Ga. and married Linda JOHNSON b. 1945 in Georgia, d. 4 May 1980 in Baconton, Ga. Harry died 4 May 1980 Baconton, Ga. buried in Miller Co., Ga.
26. William Smiley "Bill" PHILLIPS was born 16 Mar 1940 in Miller Co., Ga. and married (1)Nellie SWEARINGAN- no children; married (2) Lynette Irene ROGERS from Colorado. "Bill" died Feb. 7, 1999 at home in Miller Co., Ga. He is buried at Pilgram's Rest (White's Bridge) Baptist Church in Miller Co., Ga.
27. Etha "Yvonne" PHILLIPS was born in Miler Co., Ga. and married (1)Dale PERIN; married (2)Charles W. GASTON from Ga. Yvonne died October 29, 2000 in Decatur County Georgia. She is burried at the Gaston Family plot in Decatur County, Georgia. 28. "Myra" Jeantte PHILLIPS was born in Miller Co., Ga and married (1)Alfred Perry TAYLOR from Orlando, Fl. 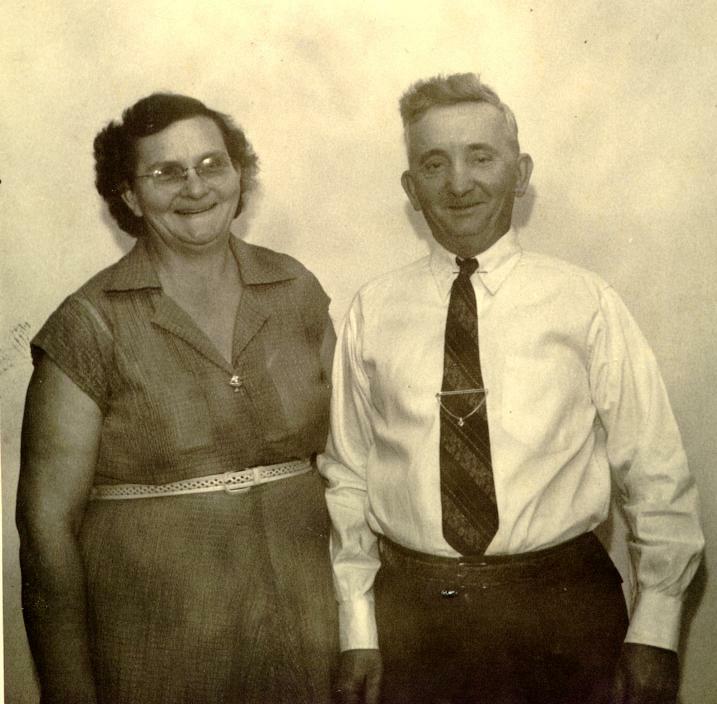 ; married (2)James Fremont STRANG born in Browns Valley, Minn.
29. Walter Robert "Bobby" PHILLIPS Was born in Miller Co., Ga. and married (1)Teri VALDEZ from Colorado; married (2)Chirl HUNTLY from Decatur Co., Ga.-no children. d. 23 Sept 1994, Miler Co., Ga.
30. John Wilson Jr. PHILLIPS was born in Miller co., Ga. and married Kathryn KOCHER from Bethesda Md. 31. Melissa "Jane" PHILLIPS was born in Miller Co., Ga. and married Charles CAMPBELL from Florida. 32. Mary Juanita "Nita" PHILLIPS was born in Miller Co., Ga. and married (1) Roy E. MILLS from Georgia; married (2)Charles WILDER from Georgia-no children. 33. "Roy" Cecil PHILLIPS was born in Miller Co., Ga. and married Darlene SANDERS from Pelham, Ga.
34. Buford "Earl" PHILLIPS was born 21 Aug 1958 in Miller co., Ga. and married Debbie BULLOCH (2 children); married Mona ROGERS (1 Child). Earl died in 1991 and is buried at Pilgram's Rest (White's Bridge) Baptist Church in Miller Co., Ga.
35. Andrew Martin "Andy" ADKINS was born in Miller Co., Ga. and married (1)Carol unknown from Ga.; married (2)Jeanie unknown from Fla.-no children. 36. "Rita" Faye ADKINS was born in Miller Co., Ga and married (1) Frank HUGGINS from Seminole Co., Ga (2 children); married (2)Mitch LOGUE born unknown (1 child). 37. "Tammie " Ruth was born in Miller Co., Ga and married (1)Woody Mitchell; married (2) a BRINSON. 38. Nora Katherine "Kathy" NIX was born in Va. and married Glenn COLWELL from Ct. They were married in Orlando, Fl. 30. Sandra Kay NIX was born in Fl. and married Steve TABB from Miller Co., Ga.
41. Richard "Ricky" Wayne PHILLIPS was born in Miller Co., Ga. and married Melba PURVIS. 43. Gregory Allen "Greg" PHILLIPS was born in Miler Co., Ga. and married Laurian BOYD from Miller Co., Ga.
44. "Robbie LaDon PHILLIPS was born in Miller Co., Ga., and married Rachael unknown. 45. "Vickie" Lynn WILBOURN married (1)Fain GRIFFIN; married (2) Don SINGLETON- no children. 46. Roger Dale WILBOURN married unknown. 47. Deana Arlene WILBOURN married (1)unknown; married (2) Todd STEMPINSKI. 48. Lori Alis WILBOURN married (1) Carlos CARNEY; married (2) Chad unknown. 50. Harry Daniel "Danny" PHILLIPS was born in Decatur Co., Ga and married Sandra BURRELL from Albany, Ga.
51. Charles Edward "Chuckie GASTON married Terri unknown. 52. Starla Marie PERIN GASTON. 53. Sherry Marlene GASTON married a COLLIER. 54. Lakeisha "Keisha" Ann GASTON married Stephen LANGDON. 55. Joseph Paul "Joey" TAYLOR was born in Orlando, Fl. and married Michele ALDERENTE of El Paso Texas. 56. Johnny Christopher "Chris" PHILLIPS was born in Decatur Co., Ga and married Angie WHIDDON of Albany, Ga.
57. Bobby MILLS was born in Seminole Co., Ga. and married Peggy HAND of Decatur Co., Ga.
58. Rocky MILLS was born in Seminole Co., Ga. and married Heather PRINCE of Decatur Co., Ga.
59. April PHILLIPS was born in Decatur Co., Ga. and married Jammy LASHLEY of Decatur Co., Ga.
60. Rebecca PHILLIPS was born in Decatur Co., Ga. and married David Jr. KING of Decatur Co., Ga.
61. Amy GRIFFIN has 1 child.